Review: Nerf, Part 1, Swords! Our family loves Nerf. Loves, loves, loves Nerf! When I buy a Nerf toy, I know I’m getting a durable, quality built, fun toy that will keep my kids active. We should buy Nerf stock. Seriously, with the amount of Nerf toys we have purchased over the years. Nerf sells a wide variety of dart guns, foam swords, and even a lazertag set. If you’re looking for good, safe, active fun that’s great for indoor play especially on rainy or subzero days, get a Nerf. And having a bin full of Nerf toys is always good for something to do when your child has friends over. Nerf makes 2 different foam swords – a smaller one, and a bigger one. They’re both durable and colorful, but are very different. 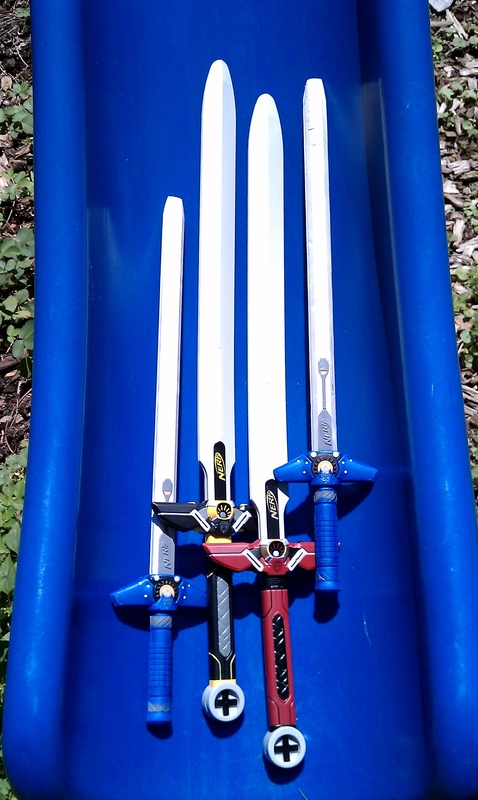 Nerf’s smaller sword (32” long) is the N-Force Fury Sword, which comes in 2 colors: Shadow Fury Blue and Thunder Fury Yellow. These are lightweight, 1 handed swords, good for younger kids. They have a shorter reach than the larger sword, and don’t hurt when hit, unless you’re seriously smacking someone. You can move quickly, and slash fast with these swords – there’s no flopping around like the bigger sword. 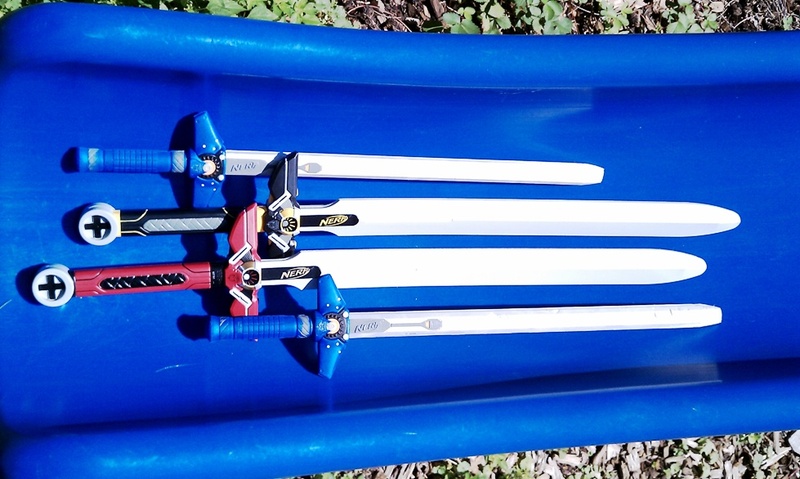 Recommended for ages 6 – 9; I think they’re perfect for any age that can hold a sword, more like ages 3 – 93. Retail is around $12 – $15. Nerf’s larger sword (41” long) is the N-Force Marauder Long Sword, which comes in red and black. These are weighty, 2 handed swords, good for older kids. They have a long reach, and will hurt when you get hit. Slightly floppy due to the weight and length, you do need to be a little bit careful when swinging. Recommended for ages 6 – 12. It would be difficult for a child under 6 to wield this sword, but for preteens or teenagers, or even grownups (like me!) this sword is a dream. It’s so much fun to hold the Marauder long sword in your hands – your really feel like Link, with the Master Sword (for Zelda fans out there). Retail is around $20 – $30. We tell the kids that swordfighting is more about form, style and movement, and using your imagination than it is about hurting your opponent. It’s important when battling to have a fair fight, and that your weapons have similar reach. No hits to the head or face are allowed, of course. We typically play with touch damage rules, meaning for example, if your opponent touches or strikes your arm with his sword, you can no longer use that arm. It gets pretty hysterical when you only have 1 functioning arm and leg, and you’re hopping around blocking hits. Next on our list to buy? The Warlock Axe – at least 2 of them.